Update (17 JUL 2018) - Digicel is having their official launch event today. This was their press statement. We've teased you with the limitless possibilities that LTE can offer and since then, we know you've been waiting for it. We've come a long way to get to this point. Even though your call quality wasn't great in the process because we've been installing tons of new equipment, you stuck with us while we fine-tuned our network to deliver LTE to you. Thank you - we couldn't have done it without your patience and understanding. Now, it's on to great news - the wait is over! We are very pleased to let you know that Trinidad and Tobago's newest LTE network has arrived. Our network is packing superfast speeds up to 10 times faster than 4G and comes to you with approval from none other than Usain Bolt, our Chief Speed Officer and the world's fastest man. What this really means is that you'll now enjoy glitch-free video streaming of your favourite online content on your smartphone or tablet, while using interactive apps at home or on-the-go. Our teams have worked around-the-clock to deliver LTE to our customers in North-West, East and Central Trinidad as well as East Tobago. South Trinidad and West Tobago will feel LTE speeds by the end of 2018. Don't worry if you haven't seen your area on the list. We'll be stepping up the pace to deliver on our promise of a nationwide rollout within the shortest time possible. All that's left now is ensuring that your device has an LTE SIM and is LTE compatible. You can use our LTE Checker at www.digicelgroup.com/tt to find out if your device is supported by our LTE network. If you need an LTE SIM, feel free to pop into your nearest Digicel store and our friendly staff will upgrade you in minutes. Once you experience it, we are confident that you'll say, "Now dat is LTE!" Enjoy! Update (3 JUL 2018) - We have released the LTE services across some areas of Trinidad and Tobago! You can use the link below to see where LTE is currently covered! 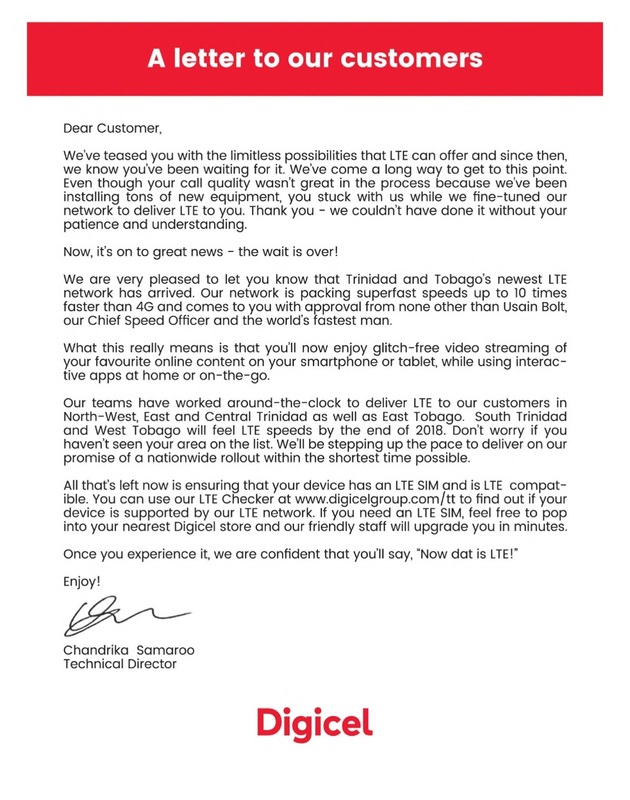 "Network readiness to launch LTE" is the correct way to describe what is going on at Digicel since TATT has not announced award of LTE spectrum. Digicel Trinidad and Tobago says that following recent successful efforts to fine tune its network, it is preparing for the introduction of superfast LTE mobile data technology by this summer. Ahead of launch, Digicel will be helping customers to get ready for LTE with information about handset compatibility and upgrading their existing SIM cards to access the technology. The company says customers can also look forward to great deals on LTE handsets and plans. Digicel is introducing superfast LTE mobile data technology across T&T, optimising its cell sites across the country to deliver speeds up to ten times faster than exiting 4G technology, the telecommunications giant announced yesterday. 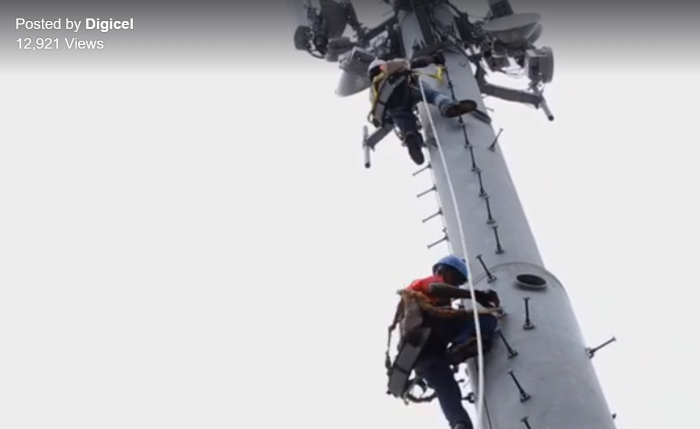 Our network transformation is now in full swing and we have stepped up the pace to begin deploying LTE within a few months, so that our personal and business customers can connect to the future of advanced mobile data. Update (2 FEB 2018) - Came across this tweet on Twitter in response to a customer complaint. There were other similar tweets to other customers with complaints on twitter. Many apologies for any data issues you have experienced. We are always working on ways to improve your experience, and we are currently in advances [sic] stages of being LTE ready and bringing actual next generation data experience to Trinidad and Tobago. Update (13 DEC 2017) - The following text message has been sent to some customers. Let me know if you have also gotten the following text message. I am guessing that if you request a swap you might be considered. I am guessing a phased approached with "beta testers" and select geographical regions. 11/12 3:41 PM Valued customer, Digicel LTE is coming soon & you have been chosen to receive a free SIM upgrade! Visit your nearest Digicel store for your new SIM and get ready for an amazing LTE experience. Update (18 NOV 2017) - Came across this email excerpt on a local forum dated 10 Nov 2017. Also there is some possible hinting in this promotional graphic on the Trinidad website. LTE, also known as Long Term Evolution, is a mobile data standard developed to meet demands on future networks as customers' needs evolve. LTE offers increased capacity with regards to stability, throughput and latency and this will deliver a superior user experience with speeds up to 10 times faster than existing 4G technology. Users will be able to use data, voice and stream video from all coverage areas at any time with no delay. Over the next five months, we will be working with our technology partner, ZTE, on a robust deployment plan that will see our current sites upgraded to LTE status. Enabling this superior experience, however, will have an unavoidable impact on mobile and ICT services. We understand the importance of our network to your business and as such, we have and will continue to ensure that all upgrade activities are scheduled to minimize any disruptions. Consistent with our Digicel 2030 vision, we are making a great effort to develop our network to meet your changing needs and we are confident that you will enjoy the benefits that LTE will bring to the areas where you do business. We will provide updates on the progress of our upgrades and we welcome feedback on your experience. Digicel advises that due to work associated with delivering an amazing LTE network, customers in some sections of Diamond Vale may experience a loss of voice or data services between the hours of 7 am to 4 pm tomorrow Tuesday 10 October 2017. Digicel apologises for any inconvenience and promises that the newer, faster network experience will be worth the wait.